To reduce the problem of overheating in laptops, the Swiss peripheral-device maker Logitech has recently introduced a new laptop cooling pad for users. 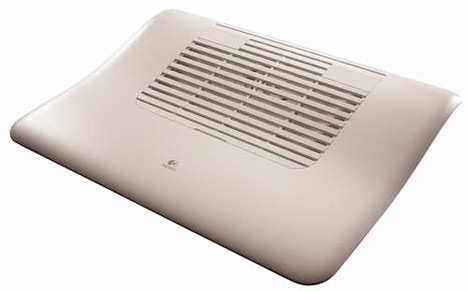 The new Logitech Cooling Pad N100 weighs 650grams and 365 x 280 x 16-46 millimeters in dimension. At first glance, the new Logitech Cooling Pad N100 is quite similar to Microsoft’s recently released Notebook Cooling Base in terms of design and features. Both Logitech’s Cooling Pad N100 and Microsoft’s Notebook Cooling Base have a curved contour and are designed to raise the laptop to an optimal typing and viewing level. Both cooling pads can be connected to the laptop via a USB cord without additional power supply and both feature a built-in fan pointed up through the slotted top to cool down the overheated laptop. Apart from the design and features, the prices for the two cooling devices are almost the same. Logitech Cooling Pad N100 is priced at $29.99 whereas the Microsoft Notebook Cooling Base is about $29.95.